From science to spirituality it is proven, a human is a remarkable, neuroplastic, creative being with the capacity to invent anything and be anyone, no matter when they start or where they come from. Now what? Where do you begin when you have a big dream and no clear path to get there? Even for the master, on the road to mastery one discovers that there is no perfection; there is no top to the mountain, but what is beyond that? Where do I start? What is beyond mastery? Breakthrough: An unpredictable, sudden, dramatic, and important discovery or development. However, Breakthroughs do not happen in ordinary circumstances. It takes focused, intense, and effective action to produce a real breakthrough. Plus you need a Game Worth Playing and the courage to break some rules! And the delightful surprise when you discover you can achieve anything and be anyone! 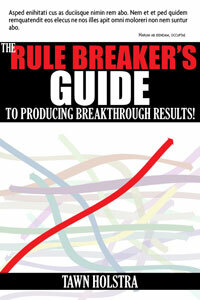 Rule Breaker’s Manifesto is your guide to achieve anything and be anyone! For every parent there is a gnawing notion that they need to prepare their child for adult life. Yet there is so much chatter from so many sources about what matters, what’s important, when should you start, when is too early, when is too late… it is truly overwhelming. Designing Your Child’s Education takes all of that chatter and boils it down you a simple plan that the parent creates… it is flexible, includes outside sources (if you want them), reflects your own values and standards because it is based on your standards and values! It also offers simple guidelines for making choices between conflicting values. For example, you may want to raise a creative, generous, and powerful leader. Great! But what happens when they take the VCR apart, or give all their toys away? How do you choose how to teach your child when they don’t “want to“ clean their room, study, share, etc.? Respect, honor, generosity, integrity are all part of life. You are your child’s first and most revered teacher. Embrace it! 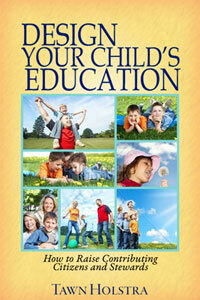 Design Your Child’s Education is a written by a mother who raised four children and is full of wonderful games and activities. A recipe collection with 38 of Seattle’s Best Chefs who all contribute to FareStart, the internationally acclaimed job training program for the homeless. Harvest Vine, Ray’s Boathouse, McCormick and Schmick’s and 28 more! Every Thursday night in the FareStart Restaurant – a unique restaurant nestled in downtown Seattle– a singular event takes place: Guest Chef Night. 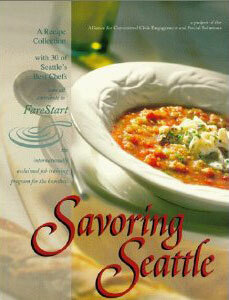 Savoring Seattle, featuring the chefs and menus of Guest Chef Night, is a tribute to this weekly celebration. FareStart first captured my interest because, while it is an excellent restaurant, it is much more than that. First and foremost, FareStart is an organization that changes lives. FareStart is a social enterprise whose mission is “to transform the lives of homeless and disadvantaged men and women, building self- sufficiency through job training and placement in the food service industry.” Every week homeless men and women who want to change their lives, enroll in FareStart. Sixteen weeks later they graduate having learned entry –level skills that qualify them for employment in fine restaurants, hospitals, schools, and other places seeking highly trained staff. Guest Chef Night is the center piece of the FareStart training program. Every Thursday, one of Seattle’s premier chefs volunteers to work at FareStart. With food contributed by the chef’s restaurant and suppliers, the chef works with FareStart students and staff to prepare a three-course gourmet meal. Seattle diners vie for months in advance for dinner reservations. FareStart students learn from the masters of their trade. Chefs gain from the reward of working with FareStart students, and frequently recruit their favorites for employment after they complete the program. Top this celebration off with a dinnertime graduation for FareStart graduates, complete with their new set of skills and their self-esteem renewed, and the Guest Chef Night recipe is complete.